Best Granville Island Attractions is the people who make it work. I love talking to people on Granville Island. Artists have open studios where you can watch them create. Some of the business people have been around for 30 years and they have great stories. 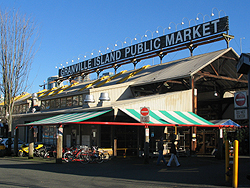 The best way to plan your day on Granville Island and to check out more information on Granville Island Attractions, visit Granville Island Works. The map is awesome and you get a real feeling for what's going on on the Island. It's known as a tourist trap but locals actually love this place. If you dig a little deeper and go behind the scenes, there is some amazing stuff going on!